After re-kindling my inner child ice skating at Half Dome Village, the day had finally come. Were we ready? Could our bodies take the 10.5 miles to the Glacier Point Ski Hut? All these questions would be answered as we embarked on what might be the best cross-country skiing adventure out there. Stepping out of our hotel room, the air seemed electric. It felt like all of our senses were cranked up past ten. The crisp smell of fresh pine and the distant roar of water seemed more thrilling. Under the canopy of pine trees, the valley was still. Nary a soul stirring in the darkness. Looking up, my eyes fell upon the Yosemite Falls. A golden ray of sunshine painted the granite cliff and made the water sparkle like diamonds. This must’ve been how John Muir felt the first time he explored Yosemite. After grabbing a big breakfast in the dining room, we quickly venture back to the truck and head out of Dodge. Following the meandering Merced River, we make it to our turn-off and begin our ascent out of the valley. As we zip out of a tunnel, we’re bathed in sunlight. The warm sun feels good. The tiny walls of snow begin to grow massive alongside the road as we switchback our way up. 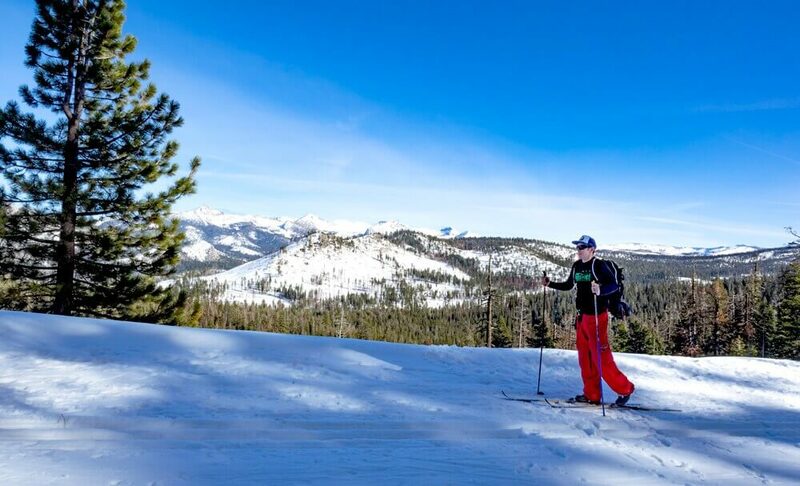 Arriving at the Yosemite Ski & Snowboard Area, we’re ready to kick this adventure in motion. Stepping into the Nordic Center, we get the low-down on our day’s journey. For athletic individuals that are experienced, they can ski out to the hut in under two hours, and for most intermediates, under four. Since this is only our second time EVER on cross-country skis, I have a feeling it’s going to take us a bit longer. The question is how much longer? Grabbing our overnight parking permit and a map, we step out into the great unknown. Compared to my split board, the cross-country skis feel like toothpicks under my feet. I awkwardly begin to shuffle up the first hill. Oh what fun! We’re feeling up-beat and positive as we slowly make progress. Looking around, the beauty of the snowscape is amazing. The flat, wide snow-covered path is easy to follow. Stopping for a bit of lunch, we look at the map and realize that our pace is a bit slow. In fact, it’s MUCH slower than we anticipated. Putting our heavy packs back on, we glide our way out of the Bridalveil Creek campground. With still over FIVE miles to go and the sun descending quickly, would we make it before nightfall? Fatigue and exhaustion start to set in. A hush comes over us as we continue to schuss our way towards the destination. After about a half-mile, the forest gives way to a big opening. To our left is a wall of rock some thirty feet high. And to our right, the land drops off exposing us to a fantastic view of the Clark Range. Our jaws drop! The orange glow of the setting sun bounces off the smooth face of Half Dome and the surrounding peaks of the High Sierra. We stand there in awe, quietly absorbing what’s in front of us. Making a 180, we step inside our cozy hut for the next two nights. To the right were all the bunk beds and to the left the dining room. In the center, a warm roaring fire surrounded by comfortable couches filled with a few people relaxing. As the initial dawn begins to pierce through the windows, everyone starts to stir. None of us want to miss the glorious sunrise! Throwing on some snow gear and grabbing a fresh cup of Peet’s coffee, we head outside. Nearly everyone from the Glacier Point Ski Hut is outside awaiting the sunrise. The glow of the not yet risen sun etches the jagged horizon sharply. As time passes, folks begin to tire and head inside until only two of us are left. All this hard work to get here, we wouldn’t miss it! For what seemed like an eternity, the sun finally explodes over the Yosemite High country with a fury. Brilliant rays of daffodil yellow shoot out of the sun and begin to warm the air and paint the landscape. Each of the colors on the peaks and valleys are intensified. From the virgin-like white snow to the stark slate grey walls of Half Dome, my eyes try to take it all in. I now understand why John Muir and Ansel Adams were so inspired by Yosemite. We step back inside and enjoy a big breakfast cooked by the hut keepers. Since the hut has snowshoes available for guests to use, we decide to take a “stab” at the activity. Grabbing some snacks and a few sandwiches, we make our plan for the day. From the hut, there’s a plethora of options to choose from. Places like Sentinel Dome and Taft Point are easily accessible from it. We decided to snowshoe to Taft Point. We start off by taking the main route until we hit the cut-off. From there, we veer off quickly onto a small snowshoe single-track. The rolling hills of pristine white snow are quickly replaced by a dense forest. Each of the trees are painted in a bright neon green moss. Against the dark red bark, it seems way more bright than normal. As the trail begins to wind up a steep hill, it opens up to a long slope that ends at a sharp massive ledge. Hoofing our way down the open face, the blanket of snow abruptly stops against the cliff’s edge. Both fear and exhilaration combine as we near Taft Point. What normally is a metal railing up to your shoulders is now just two feet above the surface of the snow. My heart begins to beat rapidly as I near it. The last ten feet I crawl on my belly attempting to make it to the edge. Looking quickly for just a moment, I peer down almost 3,000 feet below to Yosemite Valley where the Merced River winds through the brown covered meadows. Stepping back from the sheer granite cliffs, I attempt to relax and take in the moment. The silence is suddenly broken by a thunderous crack of falling rock. Due to the friction of the snow melt, Yosemite’s landscape is alive. My mind begins to race. Images of the cliffside snapping off and me falling to my death. Reality is this will not happen, but my imagination says otherwise. As we begin our journey back to the hut, I realize that this isn’t just about seeing great views but an opportunity to reconnect with humanity AND nature. During the day, you enjoy the great outdoors by yourself. And as the sun dips below the horizon, you come back and get to know people, exchange stories, and hear about their lives. The Glacier Point Ski Hut is the perfect group getaway. Some will go fast, others will go slow, but as a crew, you’ll all make it to the end. Compared to backcountry skiing, the consequences are much lower. You can play in the great outdoors and the icing is the views at the end. 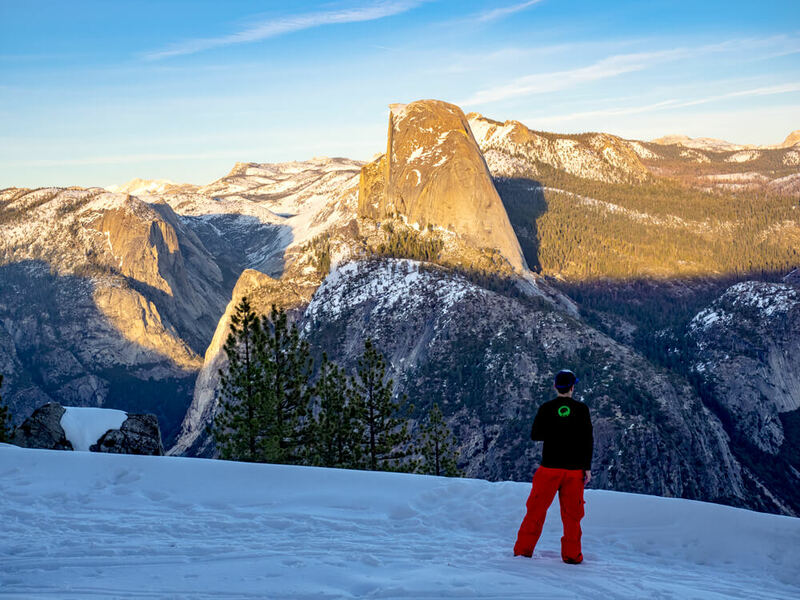 If you’re considering a trip to Glacier Point Ski Hut, here’s a few tips to maximize your enjoyment.